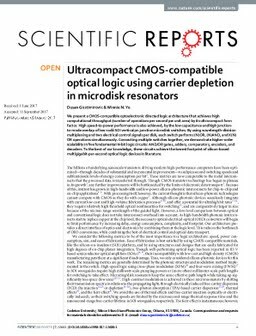 We present a CMOS-compatible optoelectronic directed logic architecture that achieves high computational throughput (number of operations per second per unit area) by its ultracompact form factor. High speed-to-power performance is also achieved, by the low capacitance and high junction-to-mode overlap of low-radii SOI vertical pn junction microdisk switches. By using wavelength-division multiplexing and two electrical control signals per disk, each switch performs (N)OR, (N)AND, and X(N)OR operations simultaneously. Connecting multiple switches together, we demonstrate higher-order scalability in five fundamental N-bit logic circuits: AND/OR gates, adders, comparators, encoders, and decoders. To the best of our knowledge, these circuits achieve the lowest footprint of silicon-based multigigabit-per-second optical logic devices in literature.